I do agree the Tangerine is being preemptive in preventing withdraws. My most 2 recent promotions were offered to me before my pre-existing promotion ended. Previously, Tangerine was giving me 2.5%, but then PC Financial/Simpli offered me 2.75%. As such, I transferred the bulk over to PCF leaving behind a mod 100 amount. PCF's 2.75% promo was about to end and they didn't offer me a subsequent promotion, but fortunately, Tangerine had offered me 2.75% and it was already active on my puny sub $100 account. I moved the funds back to Tangerine to bask in the 2.75%. This time, Tangerine preemptively contacted about my account while I was away on vacation. Upon returning and getting a hold of the Tangerine rep, I was offered 3.15% which matched the current PCF offering. I accepted it and saved myself a move. The wording on the 3.15% (4-month, and I assume the 3% six month variant) above says "...who verbally accept the Offer...". Do you actually have to call in, or can you somehow accept online? Note that the 2.75% (til Nov 30/2019) flavour offer is automatic. I'm not sure I'll even bother trying to call in about the other offers. I've just taken advantage of EQ's current 3-month GIC special (3.33%), so Tangerine's 4-month rate isn't much use. It might be nice to have the 6-month 3% in my back pocket, or the 2.75% without the minimum balance (or a bit lower), although I doubt they are set up to waive the latter. This was discussed briefly earlier. I think most of us felt 3.15 x 4 months was the better deal on the assumption that rates might go up between now and then. It depends though on how much cash is involved. On a smallish amount, it doesn't matter so much and you may prefer the security of longer term. I took 3% for 6 months - which ends mid-May for me. I would rather keep money for extra 2 months at a good enough rate. I did end up taking the 3.1% for 4 months (up to $1M balance). But after I hung up I had doubts for the same reason you mentioned Alexandre, and called back to change to the 3% for 6 months. Long wait time, so requested a callback. At the same time the callback came, a delivery I was expecting arrived so i hung up. Then I did some Googling and saw that rates were expected to rise - as you said Loonie - and read when BoC wold be announcing possible rate changes and decided to just leave things as they were. May I ask how you received the two offers? Was it by email or did you call in and get verbally presented with the two offers? Thx. Hey, MG. So I did not receive any calls or email. I called in and said my offer is about to expire and I had a 3% offer and could they do better. Rep asked from where and I told her RBC. Rep said best she could do was 2.5%. There was a convo that followed that I won't get into now because of time but fast forward, I asked to speak with a supervisor, got cut off, called back, new Rep offered me 3%, I said I was interested, still wanted to speak to a supervisor - re a CS issue - after which I brought up the possibility of the 3.15% rate. I did mention I heard some people were getting that rate. She said she would check and came back and said ok to 3.15 for 4 months on the full balance starting immediately. For every $100,000, 0.15% makes... ballpark $50 in 4 months. The old ontario government would call that a rounding error. By the way, i agree. The Habs should go but to where? Thanks for doing the math, Kidd - and first I've heard of rounding error. Re: the Habs - I know, right? But I basically lost interest after they traded Plekanec to the Leafs. Watched some when they brought him back but now he's gone for good, so not really following them. My new obsession (well, last 2.5 years) is the Golden State Warriors. I'd go with 3.15% for 4 months which matches Simpli's rate. Simplii isn't available in Quebec, Implode (great user name). i was surprised actually when Tangerine agreed to 3.15. Haven't checked but I'm not aware of any banks here offering higher than 3%. Thanks everyone for weighing in. I didn't actually call in, but was returning a call. They called me twice while I was out of country on vacation. I got their voicemail when I returned the call, and they called me back again the next day. Between a GIC of 3.33% and a savings account rate of 3.15%, I'd choose the flexible savings account rate. Lol, the 2.5% that I was referring to, is Hubert. You take the 2.75 and if you fall below 50k, you move what's left to Hubert. Hopefully you stay above the minimum, but 2.5% is better than Tang's fallback rate. You can also make the argument that Tang should offer you 2.5% if your balance does drop, or you will transfer it to Hubert. You can even wait to push that on them until it actually happens(if it happens at all). There is no need to ever get less than 2.5% as I see your situation. Did I miss something? Agreed, I am just going to stick with the 2.75% and if for whatever reason I fall below the $50K mark, I will call Tang back and see if they will at least honour me the same 2.5% rate that Hubert offers and if they don't, then swoosh! there goes my $ over to Hubert! Have a low 6 digits savings account, long time customer, since the 90s. My offer expired on Nov the 30th. Wasn't offered anything by email or phone and the interest rate on my account this morning was 1.25%. Gave them a call, only a 2 minutes wait. Was first offered 1 year GIC, then 2.5% for 6 months. Refused, told them of the 3.15% for 6 months at Meridian. Was put on hold 5 minutes to finally be offered 3% for 6 months. I declined on principle and the call ended there. Just opened an account at Meridian and will transfer my money there this week. Tangerine is harder and harder to like. Hope this info can be useful to someone here. Meridian's 3.15% is a six-month bonus for new accounts - the modern equivalent of the free toaster. If they revert you to their bland ("always competitive") 1.5% after that, are they also hard to like? Should long-time Tangerine customers who don't go haggling be offended (if they even know) that Tangerine is giving more obstreperous clients much sweeter rates? 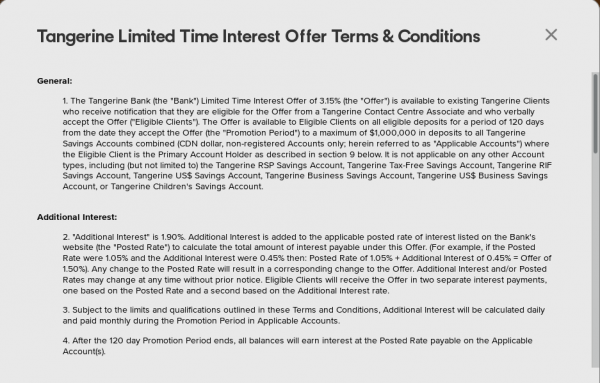 Does Tangerine really "owe" existing customers the highest rates and lengths offered by arbitrary other institutions who are chasing new business? Not to say that Tangerine has good answers to these that will make everyone happy, or that they are doing it well, and inherently, selective customer retention policies are going to seem "unfair" to various segments. But try coming up with a coherent set of policies that a large established FI could use that a lot of people aren't going to complain about, without doubling their cost of funds. I had moved out money a while ago and was not offered a new promo, but on the platform there is an offer for a one year rrsp for 3.25%. A family member who left the money there as the 2.5% expired was offered the one year for 2.75%. I just recently worked out that over the last four years of haggling, frustration, and hour-long waits on hold with Tang, including a period when i just couldn't be bothered, we've averaged 2.35% on HISA with them. I really can't complain, although it did take work and a certain amount of cunning - with a little help from my friends here. I am literally thousands of dollars richer than I would otherwise have been (even after taxes and CPI, pace Bill). Thx to all who have shared! Still, I don't expect it will last indefinitely, and I much prefer the customer service at most of the credit unions, not to mention the 3.75% and 4% GIC deals at Meridian and Ganaraska. Linked my Simplii account to Tang as an external account then called Tang to inform them of my intent to move money to Simplii. After a brief GIC sales pitch from Tang, a 3.15% for 120 promo days was offered. Simplii is one of my already linked external accounts, so Tangerine can see I mean business cuz I can easily move money out to Simplii if they didn't offer a matching rate. I still wish I could link more external accounts. 3 isn't so many when I need to use one for USD as well. Besides Simplii, if I need to move funds around, I have to two step transfer most of the other accounts. Somebody on this forum said a couple of years ago that Tangerine had increased the number of possible links. I have not verified this, but perhaps it's worth inquiring, if it matters to you. Still three links to external accounts for Tangerine clients, as of December 2018. I have the 2.75% Savings promo until Jan 15th. I also have 3.1% with Simpli. I have around $100k to deposit so gave Tangerine a call to see that if they wanted my money, they might offer me the 3% rate being given until April to their preferred clients, like my neighbor. Seems not. The policy is that I am locked in to 2.75% until Jan 15. Call them then they say? I read their Ts and Cs and nowhere does it say that they cannot increase the rate if they wish, just that they cannot decrease it? Ask tangerine for a one year gic paying 3.25%, if you can part with the money for a year. You can leave next to nothing in that 2.75% savings acccount. Read the recent thread named "BOC"
The best promos might be offered by their Marketing Department (such as 3.25% for a 1 year GIC). Try phoning 1-888-600-9890 (for example ext. 55322 or 51168). Tangerine ARE paying 3.25% on a one year gic, rsp money. I asked for and received the 3.25% on a one year gic nonregistered money. I figured, if they pay it on one, there is no reason why they shouldn't pay it on the other. Does anyone have any insight into why, unlike Tang, Simplii Fin. doesn't offer anything beyond their (so called) HISA for TFSAs ? For non-registered funds they seem to have similar rates for various GICs, and since Simplii surely considers Tang. a direct competitor, its a mystery to me why they don't offer more options for TFSA customers ? When I've asked about it, all I get is "Maybe sometime in the future..." Duh! Will Tang have Winter quarterly prom? I don't think so. Most of the current offers extend to April or May.